No, martial law hasn’t been declared in Coupland. I’m talking about giant storage tanks being transported through town. I’ve seen a lot of them lately. They come in from Highway 95 on Spur 277 on the north side of town. They come around the curve onto Commerce Street, sometimes at an alarming speed, then turn left to go east on FM 1466, past the fire station and over the bridge. A few times I wondered if the thing would just tip right over on the curve, especially with what I assume must be a high center of gravity. Sorry for the fuzzy shot but I was at the other end of the street and had to zoom in. 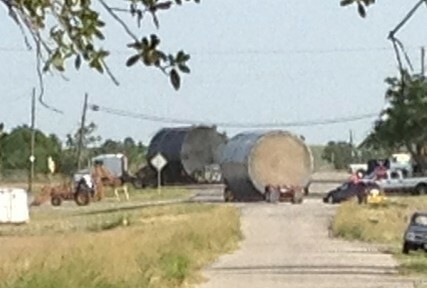 Here are two of the tanks on flatbed trailers. Two others had just passed through prior to this shot. It was only a few weeks ago that one of the tanks got stuck going over the bridge because planners hadn’t paid attention to the height of some of the railing structure. The road was closed for hours. This entry was posted in WHAT is That? 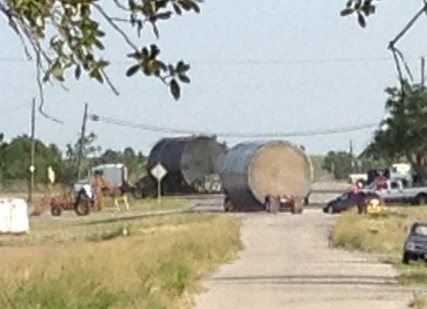 and tagged storage tanks pass through Coupland Texas on June 20, 2013 by Stewart Dale Spencer.